He was Helias, high priest of a Los Angeles occult group called the Blood Order, and he led them in shouts of "Hail Satan!" in candlelight ceremonies and rituals. 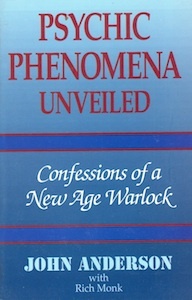 In Psychic Phenomena Unveiled: Confessions of a New Age Warlock, John Anderson… * once known as Helias, describes the trickery behind New Age miracles-he walked on hot coals, stopped his heart, and provided psychic readings for Hollywood celebrities and elite. He explains why he is now on a mission to expose charlatans such as Helias as frauds and denounce their agenda to recruit new members from the ranks of the homeless, the depressed and the lonely. This is also his story about the boyhood pursuit of the bizarre and the indoctrination into the deception of Satanism as an adult.